one-hour flow/form class offered anywhere. 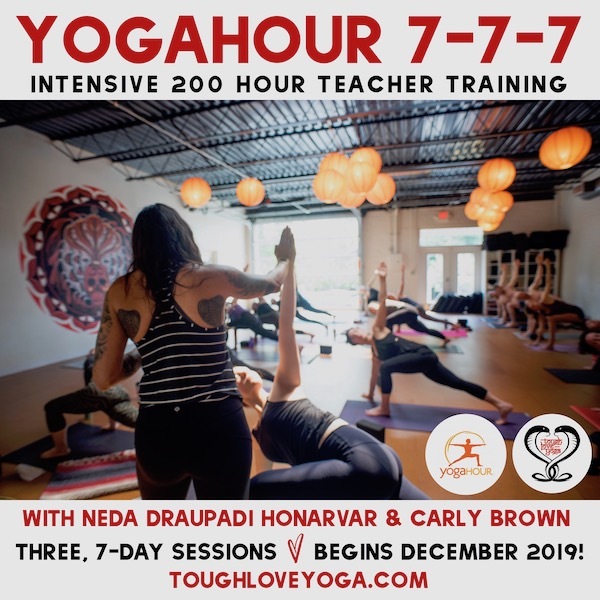 Our Yogahour 7-7-7 Intensive Teacher Training training will equip you with tools and practices that will empower you to deliver an expertly-taught flow class that emphasizes form via shape, safety, and refinement (SSR) instructions for each pose. This training is for you if you have the desire to dive deeper into your yoga practice, expand your understanding of asana and alignment, and share your love of yoga with others. This 200 Hour program is beneficial for new teachers seeking a foundation for their teaching career and experienced teachers looking for expert teaching technologies to bring clarity and precision to their instruction. Tough Love Yoga is a 200 Hour Registered Yoga School through Yoga Alliance. Upon completion of the program, you will be eligible to become a 200 Hour Registered Yoga Teacher (RYT-200). All graduates also have the option to become a yogahour certified teacher, which includes yogahour specific testing. Whether your aim is to teach or to polish your personal practice, this process will provide you with the necessary tools to achieve your goals. Training will be taught by TLY founder and yogahour Teacher Trainer Neda Honarvar & Carly Brown. The practice and thorough exploration of over 200 poses, including warm-ups, standing poses, arm balances, back bends, hip openers, thigh stretches, twists, forward folds, seated and supine poses. The goal is to help you deepen your own personal understanding of these asanas and for you to learn how to effectively teach the classical forms and modifications of these poses. $500 non-refundable deposit with application. $2000 balance due by December 9, 2019. Pay the balance with cash, check or credit card with a 3% fee. Submit your application and $500 deposit by October 31st, and pay only $1900 for your remaining balance due December 9, 2019. $800 due at the beginning of each teacher training weekend. Payment plans to be set up with your credit card and automatically drafted on December 9, 2019, February 3, 2020, and March 30, 2020. Applications are accepted on a case by case basis. All applicants are required to attend at least one Tough Love Yoga class with Neda prior to acceptance. A $500 deposit is required with all applications. Please submit your deposit either in cash or check made out to Tough Love Yoga. If for some reason your application is not accepted, your deposit will be refunded in full. Successful completion of all assignments and scheduled teacher training hours (as detailed above) is required in order to graduate and receive your certification. Exceptions may be made for special circumstances and emergencies at the discretion of our program director; however, any missed hours must be made up and will incur additional fees.